F LOATING N ever lose your radio. 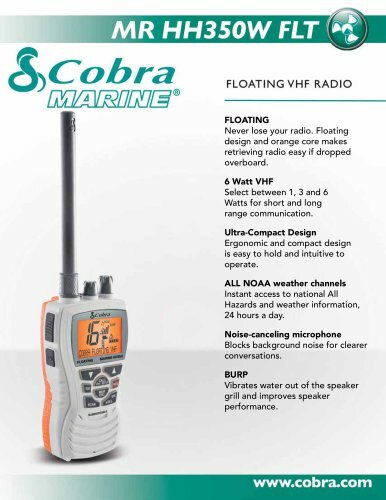 Floating design and orange core makes retrieving radio easy if dropped overboard. 6 Watt VHF Select between 1, 3 and 6 Watts for short and long range communication. Ultra-Compact Design E rgonomic and compact design is easy to hold and intuitive to operate. ALL NOAA weather channels I nstant access to national All Hazards and weather information, 24 hours a day. Noise-canceling microphone B locks background noise for clearer conversations. BURP V ibrates water out of the speaker grill and improves speaker performance.